The Cornucopia Institute published its first comprehensive report on the organic dairy industry in 2008. Much has changed since then, as the organic dairy sector has grown exponentially. However, one thing that remains the same is the focus of The Cornucopia Institute’s work: the “factory farm takeover” of organic agriculture. The scope of our mission continues to expand as more improprieties in the organic movement have come to our attention. 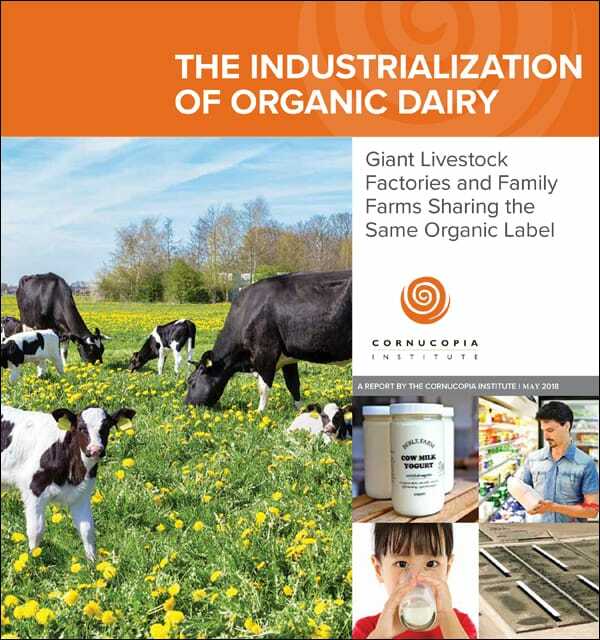 Cornucopia’s national survey of organic products available in the dairy case showcases ethical family farm producers and their processing and marketing partners, and exposes industrial-scale producers and brands that threaten to take over organic dairying. With this report and accompanying mobile-friendly rating tool, consumers can see which brands and dairy products found in your region are produced using the best organic farming practices and ethics. Based on up-to-date research into the organic dairy business, the scorecard rates over 160 different name-brand organic dairy brands and private-label products. The Industrialization of Organic Dairy will empower consumers and wholesale buyers who want to invest their food dollars to protect hard-working family farmers that are in danger of being washed off the land by a tidal wave of surplus organic milk, stemming, to a great degree, from the rise of factory farms. We invite you to join with the hundreds of family farmers and their consumer allies who support the work of The Cornucopia Institute.